Using essential oils to soothe menstrual cramps is amazing. Oils like marjoram, lavender and 13 others help a lot. But why do they help and how to apply? One of the most common gynecological complaints among adult females is cramping at the onset of menstruation. Some research has shown that over 80% of all college aged females, and more than 50% of adolescent females, will experience painful menstrual cramps on a regular basis. To manage the pain, many women try different remedies and even use pain relievers. However, next time menstrual cramps set in, instead of going to the pharmacy for pain relievers, consider using essential oils. Known for its ability to dilate blood vessels in the body, marjoram oil also has analgesic properties. Muscle relaxation from marjoram oil affects blood vessels by allowing blood flow to increase, and blood pressure to decrease, suppressing inflammation of the uterus. The analgesic properties offer relief from the pain. The effects of clary sage oil are particularly effective with the regulation of a woman's menstrual cycle. Clary sage oil can also help keep your menstrual cycle more balanced and on an even keel. Most fortunately, this essential oil has even been known to help alleviate symptoms of menopause. Lavender oil has effective anti-inflammatory properties leading to better blood flow and fewer cramps. It is also effective in treating migraine pain, soothing anxiety, and helps alleviate painful menstruation. Additionally, lavender oil has a psychological effect on the moodiness associated with anxiety during your period. Geranium oil is one of the essential oils for menstrual cramps that also ease menstrual pain. Known for its soothing properties, geranium oil may be used to relieve premenstrual tension and menopause as well. Furthermore, this essential oil helps by balancing hormones and improving blood flow, before and during menstrual cycles. Well known for its incredible anti-inflammatory properties, German chamomile is a natural way to ease the lingering pain of menstrual cramps. This essential oil is also a mild and effective treatment for delayed and irregular menstruation brought on by stress, anxiety, and tension. Moreover, chamomile oil contains an antispasmodic agent that relaxes muscles and reduces premenstrual pain. Eucalyptus oil has anti-bacterial and decongestant properties that are useful for both menstruation and upper respiratory issues due to colds and flu. Additionally, this essential oil also is an immune stimulant, analgesic, and has anti-inflammatory agents to help reduce the symptoms associated with PMS. Rose oil contains a substance called emmenagogues. It works on the body by stimulating hormone secretions which trigger menstruation. This is particularly effective for those suffering from obstructed or irregular menstrual cycles. This essential oil also offers relief from menstrual cramps, and antidepressant properties that have a psychological effect on the moodiness associated with anxiety. This essential oil has antidepressant and antispasmodic properties that help mood swings and reduces high blood pressure. It also has a sedative for those with PMS that help them cope with stress related to anxiety and depression. More importantly, ylang-ylang oil also has the added benefit of combatting anger by soothing the brain and central nervous system. Turmeric oil contains a powerful antioxidant that helps prevent damage from free radicals, and anti-inflammatory properties that relieves pain and inflammation. Turmeric oil is one of the essential oils for menstrual cramps that have the added benefit of a cleanser for the liver and intestine. Additionally, it helps relieve stomach aches and nausea when used as a tonic. Known for its ability to slow bleeding, yarrow is also beneficial in controlling the heavy bleeding of an irregular menstrual cycle. It is a restorative and powerful analgesic pain reliever with the added bonus of an anti-inflammatory ingredient that also offers pain relief from menstrual cramps. This essential oil has antispasmodic properties that helps reduce high blood pressure. 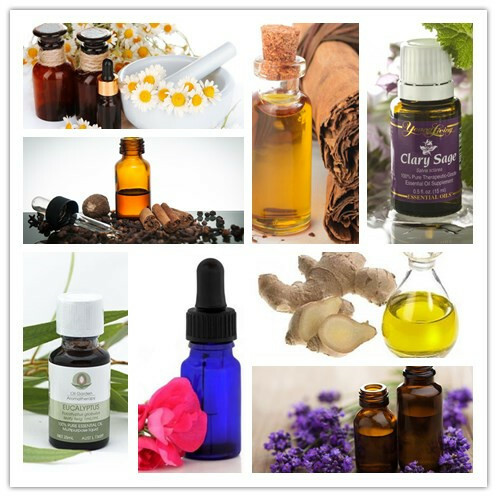 Clove essential oil is very effective in alleviating menstrual pain, limiting excessive menstrual bleeding and shortening its duration. Moreover, clove oil has also been shown to have positive effects on those afflicted with diabetes. Cinnamon oil is anti-inflammatory in nature and helps facilitate menstruation while relieving menstrual cramping. The analgesic agents act as a natural pain reliever and this essential oil most notably alleviates bloating. Another benefit is that cinnamon oil aids with the expulsion of stored intestinal gas. Magically, this oil also enhances the property of other oils when mixed. Motherwort oil is used for irregular menstrual periods. It might also stimulate uterine tone and blood flow, helping to trigger delayed periods. Most notably, it provides excellent relief for menstrual cramps, especially those accompanied by irregular periods. Other qualities include a calming effect for nervous irritability. Ginger oil improves blood flow and circulation and is one of the most effective home remedies for menstrual pain. It is analgesic in nature and reduces the pain of irregular and painful menstrual discharges, and its anti-inflammatory properties can be attributed to the presence of a substance called Zingibain. When it comes to treating menstrual cramps using essential oils it can be effectively accomplished in two different ways or in combination with each other. You may want to try both to see what works best for you. Massage therapy uses essential oils as a topical application to get the desired results for pain relief as it relates to menstrual cramps. Because the symptoms are generally worse in the day before and the first two to three days of the menstrual cycle, massage will be most effective during this time. You can mix a few drops of the essential oils with carrier oil or a preferred topical lotion, and then massage it into the lower abdomen. Multiple studies have shown that it will significantly reduce the pain from menstrual cramping by up to 50% in some cases. Using more than one type of essential oil can treat multiple symptoms as needed. Aromatherapy uses a diffuser to release the oils into the air continuously, and provides an aromatic treatment for menstrual cramps. Aromatherapy is beneficial throughout the menstrual cycle and can have many other benefits, including reducing anxiety and stress, thereby enhancing more positive moods. If you don't have a diffuser, no worries, you can simply put a few drops into your cupped hands and inhale the aromas in that manner. For those who have severe symptoms of dysmenorrhea, consider using a combination of methods to ensure you get as much relief as possible using essential oils.